The first time I went to destination spa Ragdale Hall (many, many years ago) they had one pool. With the opening of their heated rooftop pool, they now have six. 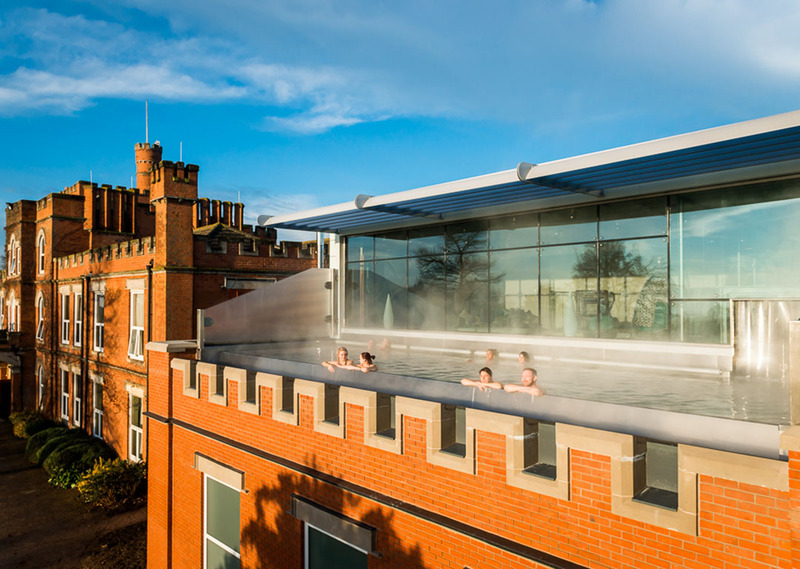 The stainless steel 12-metre pool is perched high above the crenelated walls of Ragdale’s main manor house, jutting out from a large glass-fronted indoor lounge. It must have been a real engineering challenge. Its Austrian designers have made it look as though the structure has always been there: it looks so right. Just having this striking addition makes the rest of the spa feel bigger, brighter and more contemporary. Rooftop pools have long been a feature of high end hotels all around the world, where you can swim overlooking cities, beaches or distant mountains. 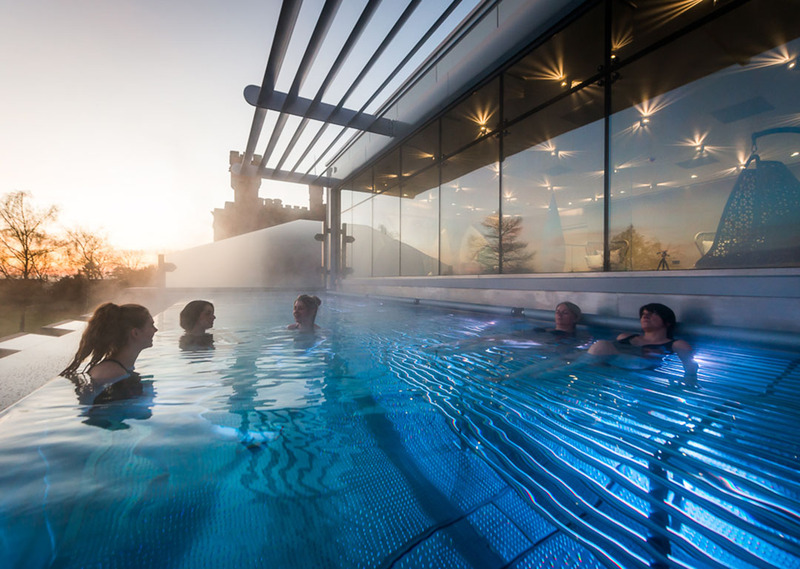 Now we’re seeing more rooftop pools in spas across the UK -- see Rudding Park, Thermae Bath Spa -- hopefully marking the end of the dark basement spa. It could be part of the need to bring the outside in to our spa experiences. Studies have linked low Vitamin D and lack of sunshine to mood disorders such as depression. A rooftop gives you plenty of light, but also views, embracing the trend for ‘forest bathing’ from the Japanese concept Shinrin-yoku. With our weather here in the UK, a rooftop pool needs to be very warm and very sheltered. 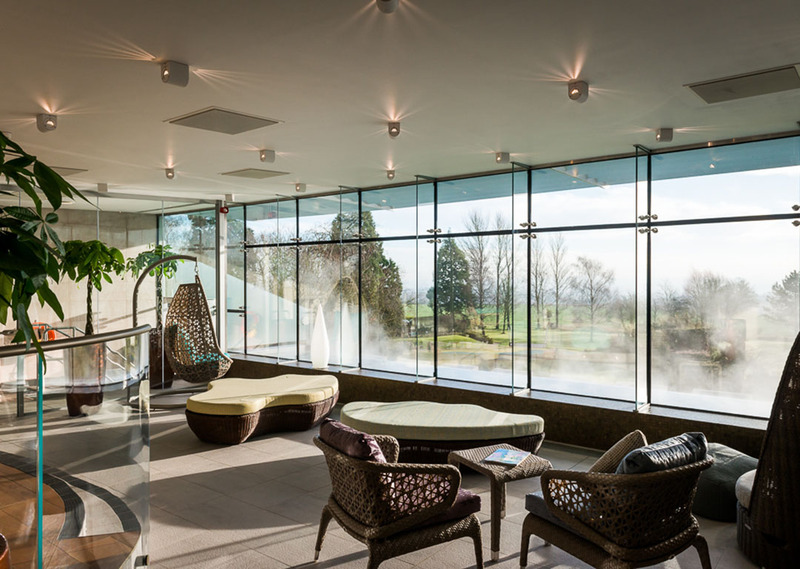 At Ragdale, the 35-degree water temperature and the curved overhanging roof combine to keep spa-goers warm and snug while enjoying uninterrupted views over the rolling Leicestershire countryside. Lie back and relax on underwater massage jet seats, and gaze at the distant horizon. 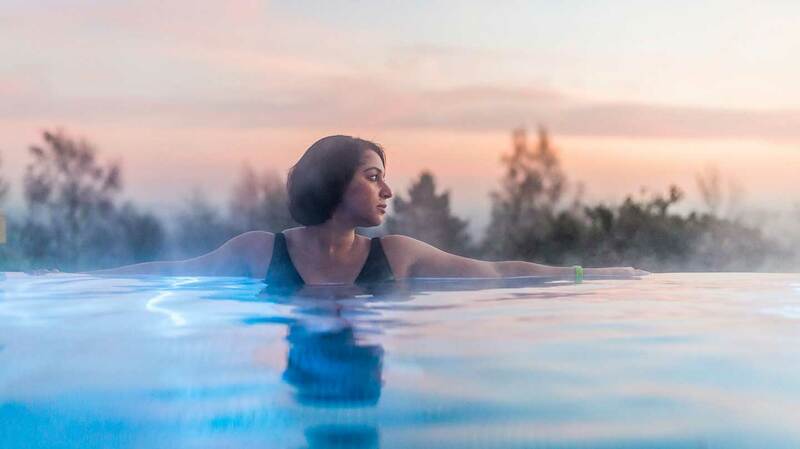 Or simply immerse yourself in the warm, steamy water at the infinity edge of the pool and lose yourself in the great expanse of fields and sky. At night the water is lit by coloured underwater lighting. I would love to use it when it’s snowing. One floor down is the exercise pool which has new colour changing mood lighting designed by the team behind the light show at the Rio Olympics opening ceremony. Very swish, and there are new exercise classes to go with it. In the bright, modern stairwell leading to the outdoor pool you can’t miss the dramatic lighting installation Leaf by architectural designers Luum, a cascade of gold aluminium discs that catch the light from the skylight above. 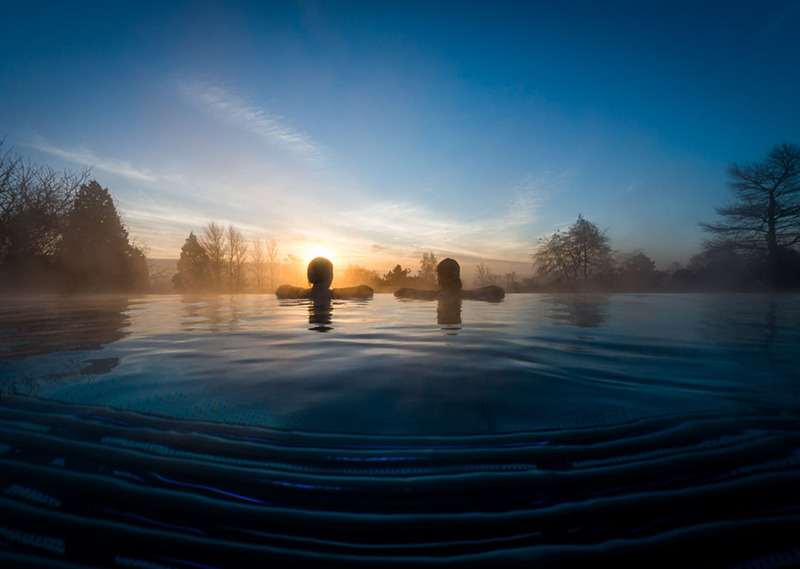 Between the thermal spa, the main pool, the classes and now the rooftop pool, you can be pretty busy at Ragdale -- ‘busy’ in a relaxed, unwinding sort of way. The customer service is always very good here. You feel taken care of from the moment you hand over your car keys; someone parks your car for you and takes your luggage to your room, while you sit down in the cafe and are offered a drink. I booked in for an Overnight Reviver Stay, available on selected dates from £222 -- just right to get away from the world and recharge your batteries. As well as the included 50-minute face and back therapy, I also booked a Decléor Lift and Glow Face and Body Experience (150 mins £170). I was sold when I read that this treatment offered anti-ageing innovations designed to target the signs of ageing. Just what this maturing Spa Spy needs! My therapist Petra personalised the treatment well. She noted my dry, rather delicate skin, so mixed the exfoliant (which smells lovely as it contains orange and apricot natural fruit seeds) with a serum to help protect the outer layers. This is a long treatment, which I love, but it can be difficult to stay comfortable on the bed for two and half hours. Petra adjusted the bed carefully and put a bolster under my knees. When it was time to turn over on my front she carefully placed a heat pad on my lower back to help me relax. The massage was long, deep and very effective. I loved the sideways movement of Petra’s hand across my back which made me deeply relaxed. The treatment includes a facial with ‘facial Pilates’ massage designed to lift and firm the skin. The magnolia serum used on my face smelt wonderful and felt rich and creamy. My skin looked glowing, the fine lines around my eyes and mouth were less noticeable and my jowly jaws were much improved. I’ve seen many changes over the years at this destination spa: first, the instillation of a huge L shaped swimming pool, then the addition of the thermal spa (with my favourite, the candle pool,) and later new rooms and lounges. Each time I have been amazed at how well they have integrated the new into the established, without changing the welcoming and friendly atmosphere. So, who would like it? Anyone who needs a bit nurturing, friends who want to spend some time together and, of course, water babies who want to try out that stunning rooftop pool. I will be back, and mine is the first bubble-jet seat on the right. Say hello as you get in! Fed up with stepping up in step aerobics? BEAM yourself up. Our friends at Ragdale Hall reach their ruby anniversary.